Spring is just around the corner, one more cold and wintery month to go. There are lots of lovely plants to look out for at this time of the year some of which have been in flower for a few weeks now. Snowdrops and Iris reticulata’s are just coming out in my garden. While winter aconites are now appearing in the woods locally and Hellebores are starting to push up their fresh green flower shoots in a wide array of colours. There is nothing like getting outside on a bright crisp morning and enjoying these beautiful plants. With all that in mind here are a few of my favourites for February. 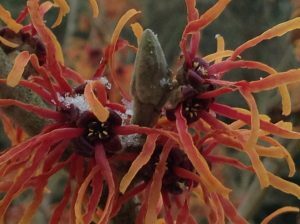 If you want something to encourage you to get out and in the cold months of the year then you must plant a Hamamelis in your garden. These have wonderful spidery flowers which gradually unfurl over a day or so. When fully expanded several varieties produce a sweet spicy scent. H. ‘Jelena’ is one of my favourites as it has a lovely mixture of colours on the petals. They are a rich coppery burnt orange in the centre and gradually fade to a zesty orange-peel colour towards the tips of each petal. The scent is light and sweet. Like all Witch Hazels they prefer a soil that does not dry out in the summer. If you want lots of flowers then nip the tips of the new growth out when they have grown to about 30cm (1ft) long as this encourages side shoot development and therefore more flower bud development. There are lots of different varieties to choose from some of my favourites include H. x intermedia ‘Diane’ with its deep burgundy red flowers, H. x intermedia ‘Aphrodite’ with deep cinnamon-orange flowers, H. x intermedia ‘Pallida’ with lemon yellow flowers and a very good scent and finally H. x intermedia ‘Arnold Promise’ which has sulphur yellow flowers and flowers later than most. 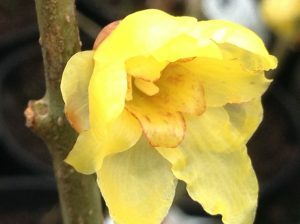 If I had to choose my favourite plant, Chimonanthus praecox ‘Luteus’ would definitely be in my top 10. I can’t imagine my garden without this at this time of the year. It is an absolute stunner. The straight species C. praecox has greyish- yellow flowers with a deep maroon centre. Whereas C. ‘Luteus’ has sulphur yellow flowers with a very pale stain or sometimes no stain at all. The scent is incredible as it drifts through the garden on a still crisp winter’s morning. Unlike some shrubs the scent lingers all day too. Grow this on a north wall in a walled garden where scent cannot escape simply delicious. My one has been in flower since the New Year and will continue to flower until the end of February. They respond well to pruning and produce lots of side shoots which will bare flowers the following year if pruned regularly. 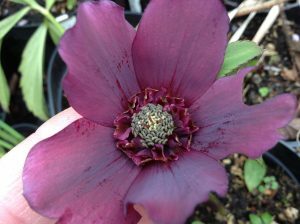 They are tough and hardy and do well in colder spots in the garden too. It always amazes me just how tough these early herbaceous perennials are. They push up out of the ground when all else is still only just starting to think of growth. 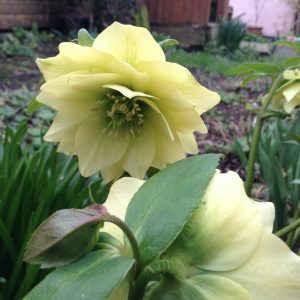 Hellebores produce an array of different coloured, single or double flowers which the early bees adore. These plants love a humus rich soil with lots of leaf mould. They will grow in full sun but prefer to be in semi-shade. Nowadays there are lots of named forms and groups which produce flowers with central spotting, swollen nectary’s (as in the picture below), or with fancy coloured petal markings. I personally like the older forms which tend to breed with one another and create lots of seedlings which in a few years will flower, that’s the exciting bit seeing that new plant flower for the first time and discovering whether it’s a stunner or not! If you want a good dense reasonably short growing evergreen then you cannot beat Sarcocca hookeriana ‘Purple Stem’. There are quite a few species and cultivars of these now to choose from. S. ‘Purple Stem’ is a suckering shrub that will get to roughly 1m (3′) tall and 1.2m (4′) wide. 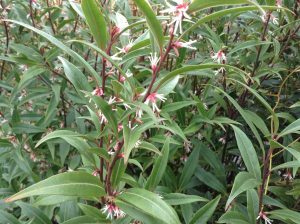 It produces clumps of pink tinged white flowers that have almost no petals and long stamens. They release a sweet soapy scent which smells better outside than in (in my book). Like all of this genus they prefer full shade as they tend to go yellow in full sun. 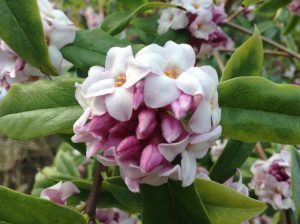 If fragrance is something you search for in the garden then why not try a Daphne. D. bholua is a tall growing specie which can get to 2m (6′) tall. This evergreen (or semi-evergreen in cold winters) prefers full sun to semi-shade in fertile, humus rich soils that are well drained. The scent is incredible and carries through the garden on the slightest breeze. I am lucky enough to have one in my garden at home which flowers usually from late January until mid to late February depending on the weather. There are other good varieties to look out for such as D. bholua ‘Spring Beauty’ which has a slightly darker mauve flower in bud and D. bholua ‘Gurka’ which is often deciduous in winter. Along with Snowdrops (Galanthus), Iris reticulata are often out in flower in early February. They thrive in well-drained soil that has good fertility in full sun or part shade. They are a good subject for growing in pots and make excellent companions with alpines in troughs and rock gardens. There are many different cultivars which range in colour from pure white to deepest purple. 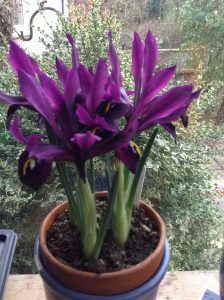 Some to look out for include I. reticulata ‘Pauline’ which has rich royal blue flowers with golden markings on the lower petals. Also I. r. ‘Natasha’ which is pure white with orange markings and I. r. ‘Katherine Hodgkin’ which has a mixture of pale green and blue flowers with yellow markings. Snowdrops – now is the time to split up those dense clumps that have stopped flowering or that are too congested. Dig up the clump, separate out into smaller clumps, and then replant to the same depth as they were in the ground. I tend to plant my clumps of Snowdrops in groups of 5 bulbs as I feel this looks more natural than one here and there. Potatoes – if you want to grow your own delicious potatoes or have always wanted to, then now is the time to have a go. Some of my favourites include ‘Juliette’ which is a main crop variety. The tubers it produces are beautifully waxy when you eat them and make great new potatoes with salad in the warmer months to come. The best potato salad I have made was made with these! ‘Charlotte’ is a good second early potato which reliably crops and is nice tasting. ‘International Kidney’ is better known as ‘Jersey Royals’ and is often the first to crop if you get them planted under protection now. Grow in pots or potato planters with a good compost. I find that a minimum size of 10 litre pot works well, any smaller and the yields tend to be small. Saturday 24th and Sunday 25th March is our Spring Open Weekend. Come and see our range of lovely plants in the Plant Centre or browse the garden sundries and gifts in the shop. Why not have a stroll around the beautiful garden and then pop into the Café and have a coffee and indulge yourself with one of our delicious cakes some of which are gluten free. We look forward to seeing you.